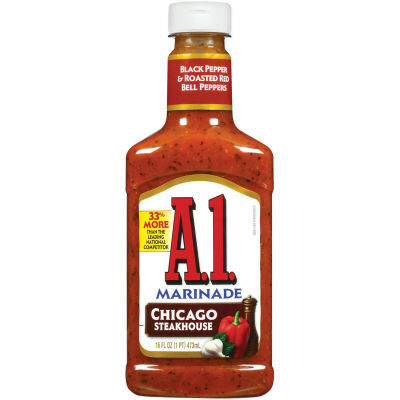 A marinade that contains all the right ingredients to turn your everyday steak into a heavenly mouth watering steak. This tomato-based marinade with a twist of coarse black peppers and a turn of roasted red bell peppers, when combines with other savory ingredients creates a divine sauce that skyrockets the flavor of anything it is cooked with!Steaks as Good as from ChicagoSteaks from Chicago are world famous, but not everyone has access there. A.1. sauces has solved this problem. Now visit Chicago and enjoy their juiciest steaks all from within your home! Just let your steak sit in the marinade for 30 minutes before grilling it. And next minute you know, you are sitting in Chicago feasting upon the most scrumptious steak ever! Serving size 1 Tbsp (16 g).